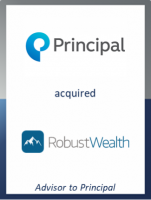 GCA acted as exclusive financial advisor to Principal Financial Group, Inc. (NASDAQ: PFG), a global financial investment management and insurance company, on its agreement to acquire RobustWealth, a leading financial technology company in the wealth tech sector. This deal adds to GCA’s extensive track record as a leading financial advisor for the financial technology sector, having advised on a number of successful transactions. The transaction was signed on May 30, 2018 and is subject to customary closing conditions. Terms of the transaction were not disclosed.